If you love all things retro, then you get the best of both worlds with the modern retro toaster oven. Retro toaster oven with modern features can bake, broil or toast. Yes, the menu can be a long list such as toasted bagels, baked pizzas or broiled steaks. Modern retro style bread toasters come with advantages such as wider slots for your bagels or your thick slice of home baked bread. Importance is also placed on the cool-to-the-touch exterior. The retro bread toaster machine makes it easy for you to get the perfect toast each and every time just like the way grandma toasted hers. With the retro toaster oven coffee maker all-in-one, you save the cost and space for a separate coffee maker. If you just want to toast bread only, then the simple retro looking toaster or even the retro hot dog toaster might appeal to you. The 3-in-one toaster oven is great for college students, singles, teenagers or elderly parents who stay alone as well as those staying in small apartments. It’s also great for camping at RV campsites where there is electricity supply. My retro kitchen toaster oven gets to be used practically every morning. And so is my coffee maker. This red retro looking toaster oven has a capacity of 22 L (about 23 qt). It has 3 control buttons – temperature control knob, functions knob and the 60 min. timer/toast button. The temperature can be adjusted between 200 – 450°F. Operating power used is 1500W. There is a removable crumb tray, an aluminum baking tray as well as 2 nickel plated racks. The heating element is made of stainless steel and oven has power indicator light. You can use this stylish modern retro looking toaster oven for baking, convection baking, toasting and broiling. This cute 3-in-1 toaster coffee maker with retro looks comes with a toaster oven, a coffee maker and a breakfast griddle all in one machine. There is a 15 minute timer knob and mode control knob (3 modes altogether). The indicator light will let you know when the machine is switched on. The coffeemaker has a 4 cup capacity. It has its own on/off switch as well as its own cover. The coffeemaker comes with a swing out filter compartment as well as a pause and serve anti-drip feature. Coffee maker has no auto off feature. On the top part of this compact retro toaster oven is the 6″ diameter removable frying griddle. To use the non-stick griddle, first set the timer to your desired time. Then use Mode 1 (Griddle/Broiler only mode) control. When frying is done, turn the timer to off position. Use it to fry eggs, sausages etc. Griddle can also function as a hot plate. Included is the toaster oven baking pan, chrome baking rack and the removable crumb tray. When toasting bread, place the bread directly on the baking rack. Only 1 slice of bread or 1 bagel can be toasted at any one time. When broiling food on the baking pan, preheat the oven for 2 minutes. (The Americana Deluxe EBK-1782R Breakfast Station is a bigger size whereby you can toast 4 slices at the same time). The oven can also be used to defrost or heat up frozen food besides broiling food. This means that you can have fried eggs, a cup of coffee and toasted bread for breakfast all done using just this one machine, the Americana by Elite 3-in-1 Mini Breakfast Station. This saves cleaning up time as well as countertop space. Only baking pan is dishwasher safe. The machine operates on 500 watts and 110V. It measures 10.8 x 17 x 11 inch. The oven and griddle will shut off automatically when timer goes off. This retro style toaster oven coffee maker 3-in-one comes with a limited 1 year manufacturer’s warranty to the original purchaser. This is a large family size retro toaster oven coffee maker breakfast station. The machine includes a toaster oven, griddle and a coffee maker. It comes with 2 buttons, one for choosing the cooking mode and the other is a 30 minute timer with auto shut-off. The coffeemaker has its own independent on/off switch. This is a 1500 watts, 120V toaster machine. The oven toaster machine measures 11.5″ X 19.5″ X 12″ and weighs 12 lbs. You can toast up to 4 slices at any one time or bake a 7″ frozen pizza. You can bake, toast and reheat food in the oven. The crumb tray and oven tray (about 9.5″ x 8.75″) is removable for easy cleaning. Wire rack is also included. 4 cups of coffee can be brewed at a time. Included is the reusable cone filter and the filter basket. You can fry eggs, sausages, burger, pancakes etc. on the non-stick griddle. It comes with a glass griddle lid which makes it easy to check on the food frying on the griddle. This red retro toaster machine comes with a 90 days limited warranty. Use it to broil, bake, toast and reheat. It can fit in a a 12″ artisan, ready made or frozen pizza. You can fit in 6 slices of bread for toasting. It comes with adjustable toasting control as well as a timer. Cool features include an adjustable temperature up to 480°F and a 60 minute timer with auto shutoff plus a stay 0n cooking feature to extend your cooking time. This is just a simple vintage inspired toaster with 2 large toasting slots. You get the choice of 3 control buttons for bagel, defrost and cancel options. These buttons stay lighted when pressed. The bagel button has a toast one side option. This is great for burger buns. There is a total of 5 browning levels. The removable crumbs tray slides out easily from the bottom. The cord storage is also at bottom of unit. This 750 watt toaster is great for thick slices of bread. The outside body is made of hard plastic while the inside is metal. The plastic body stays cool to the touch while toasting your bread. Well, it does certainly win in looks. The retro toaster oven – vintage style toaster machine looks cool and lovely. 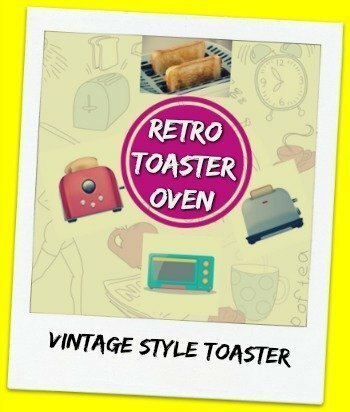 If you love retro kitchen appliances, then you should really buy this retro style toaster to add to your collection. Besides, the retro toaster is truly useful especially when rushing to prepare breakfast in the early morning.